Online4baby.com offers a Free Delivery Service to most of the UK mainland on all orders over £49.99* (£5.95 for deliveries on all orders under £49.99*). These are in addition to the standard £5.95 delivery charge for orders under £49.99. In order for you to track your order, please use our online tracking system. To access our online tracking system, please click here. Can I ship to a different delivery address? **Important** Orders placed and paid for over the phone must be delivered to the cardholders address. Yes, Saturday delivery is available to most of the UK mainland which are standard NEXT DAY DELIVERY postcodes. The Saturday delivery service is an extra charge of £12.50 and is a 'Delivery Option' when processing your order through the checkout process. Delivery will take place before 6PM. On the delivery page of the checkout process, there is an option titled ‘Change Date Of Delivery’. This allows you to specify the date you would like your item(s) to be delivered. Will I receive a text message when my item has been dispatched? Yes, all our customers receive a text message/email notification direct from DPD Couriers on the morning of the delivery. This service is not available on deliveries that contain Nursery furniture. The specific 1 hour delivery window provided from DPD (our courier) is the latest innovation which ensures the best possible success rate for our valued customers. The revolutionary 1 hour delivery time slot means that you no longer have to wait in all day for your parcel to arrive. Updates sent to your email address and mobile phone keep you up-to-date with when you should expect your delivery, making your online4baby shopping experience even better than ever! Please note that once you have requested via email or text response to collect from your chosen shop, you cannot redirect the delivery to occur via any other method. (I.e. Delivery to your original address or collect from depot etc). The parcel will stay at your chosen shop for a maximum of 3 days from the date you arrange to collect. If the parcel is not collected then this may be returned and standard return charges will apply. If you cannot provide us with a mobile number, as an alternative Online4baby and DPD will send you your dispatch and tracking information via the email address you have provided us with when registered. Yes, DPD now offer a collect from shop option. You simply select this option from your text message or email you willreceive on the evening before delivery and you can choose from a list of local stores. **Important note** You must take along with you x2 forms of Identification. One must be Photo ID and one must be a Utility Bill. Collection will be refused if these are not presented at the time of pick up. 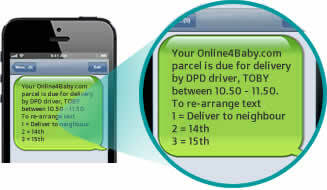 Online4baby understands that customer lead very busy lives and therefore our courier, DPD offers a service called "Predict". Providing you supply us with a current mobile number and/or email address﻿ gives a unique 1 hour delivery window notification via SMS and/or Email on the morning of your delivery. Even better still this can be rescheduled by you to a more convenient delivery date. This allows our customers to maximise the benfits of a hassle free shopping experience with Online4baby. Can I collect my parcel from the depot? Yes, certainly. You'll need to contact our courier DPD at least 24 hours in advance so they can get your parcel ready for collection and make sure no further delivery attempts are made. You can do this by following the instructions from the calling card left. Details will be on the card left by their driver, including the opening times of your local depot. Please note that for security reasons, we ask that you bring in two forms of identification. Anyone is able to sign for the delivery, as long as they are at the delivery address or alternatively, if you have selected "Leave with a neighbour" from your predict 1 hour notification, your neighbour can sign for this delivery. My address is difficult to get to. Can I leave directions for the delivery driver? At the checkout stage, under the section ‘Instructions to seller’ you are able to include certain brief information / instructions for the delivery. What do I do if I have only received part of my order? Firstly we would like to kindly ask you to check inside all the packages received, as some items are packed together. If you have done this and you are still sure that part of your order is missing, please contact us by email at customerservices@online4baby.com (please include your order number in the email) or contact us on 0161 688 1550. What do I do if I receive my goods but the packaging is damaged? Before you refuse the delivery, we ask that you check inside the box to establish if the item itself has been damaged. (The packaging is simply used to protect the item whilst in transit) If you find the contents to be spoilt, please sign for the goods as damaged and contact us by email to customerservices@online4baby.com (please include your order number in the email) or contact us on 0161 688 1550. Why has my item been returned to you? The return of parcels back to us (RTS – Returned To Sender) occurs when our courier has made at least 2 attempts at delivery, and the item(s) have been held in the local depot for 2 days (from the date of the Second delivery attempt) and the recipient has not attempted to make alternative arrangements with the courier within this time frame. *These charges do not include out of area delivery surcharges. Please contact us by email on returns@online4baby.com (please include your order number in the email) or contact us on 0161 688 1550. Will the delivery driver contact me before he delivers my item(s)? The delivery driver will only attempt to ring a telephone number provided if he is struggling to locate the delivery address. However you will receive a text message/email on the day of delivery (if you have provided a mobile phone number and email address) informing you of your precise 1 hour delivery notification. How do I authorise the delivery to be left with a neighbour if I am not at home? At the checkout stage, under the section ‘Delivery Instructions’ you are able to include certain information / instructions for the delivery driver. Alternatively, on the morning of your delivery, you will receive your precise 1 hour delivery notification which gives you the option of requesting the delivery is left with a neigbour. How do I authorise my delivery to be left in a safe place if I am not at home? Do you deliver to B.F.P.O's? No our courier (DPD) cannot deliver to PO Box addresses. We currently ship to all the United Kingdom, Republic of Ireland and the Channel Islands. FREIGHT GOODS are delivered between 8am and 5:30pm (a full working day)﻿. All our customers receive a text message notification direct from Parcel Force Couriers on the morning of the delivery with a 1 hour timeslot. Nursery Furniture deliveries such as Room sets, Wardrobes, Dressers, Cot beds with Mattresses, Junior/Toddler beds with Mattresses and Nursery Drawers are classed as FREIGHT due to their volumetric size(height above 1.3metres) and do require special vehicles and handling. The courier we use is Parcel Force who provide a Free Express Next Working Day Delivery Service to most of the UK(see exceptions below)on all orders over £49.99*(£5.95 on orders under £49.99). The contracted hours for deliveries of FREIGHT GOODS are between 8am and 5:30pm (a full working day). A Contact telephone number must be provided to Online4baby when placing an order. Please note**The Free Delivery on Freight goods will only be attempted once with our dedicated courier service Parcel Force. Any missed deliveries will incur a second attempt redelivery charge of £5 per parcel. All postcodes in England,Wales and most of Scotland (Excluding the Scottish Highlands & offshore Islands as listed below). You will also receive an email the evening before delivery with your tracking information and a text message on the morning of delivery with a 1 hour timeslot. Yes, Saturday delivery is available to most of the UK mainland which are standard NEXT DAY DELIVERY postcodes. The Saturday delivery service is an extra charge of £12.50 and is a 'Delivery Option' when processing your order through the checkout process. Delivery will take place before 5:30PM. You will receive an email to confirm your order has been dispatched and a text message on the morning of delivery with a 1hour timeslot for your delivery direct from our courier Parcel Force. With deliveries which are FREIGHT GOODS, due to the size of the parcels and the special handling required. The customer has to make themselves available at the delivery address all day between 8am and 5.30pm to sign for the parcel(s), However you will receive a text message on the morning of delivery with a 1hour timeslot. It is extremely important to make sure someone is available at the delivery address all day (between 8am and 5:30pm) to sign for the parcel(s). A Contact telephone number must be provided to Online4baby when placing an order. You can request at order checkout that a neighbour can sign for the parcels if you are out. Current utility bill or council tax bill confirming your address. No, unfortunately, it is not possible to pass additional delivery information to the courier. What do I do if I have only received part of my delivery? Firstly we would like to kindly ask you to check inside all the packages received, as some items are packed together all in one box. If you have done this and you are still sure that part of your order is missing, please contact us by email at customerservices@online4baby.com (please include your order number in the email) or contact us on 0161 688 1550. Before you refuse the delivery, we ask that you check inside the box to establish if the item itself has been damaged. (The packaging is simply used to protect the item whilst in transit.) If you find the contents to be spoilt, please sign for the goods as damaged and contact us by email at customerservices@online4baby.com (Please include your order number in the email) or contact us on 0161 688 1550. We aim to respond to your enquiry in the quickest possible timeframe. We appreciate that all items that are delivered are not necessarily purchased for immediate use. So to avoid disappointment on opening we would ask that all your parcels are checked thoroughly on arrival and then in the unlikely event that you are not completely satisfied with the condition of how your order has arrived you must contact us with images of any damage to the item and the packaging within 24hrs of receipt so that any problems can be rectified immediately, this is the timeframe that enables us to claim from the couriers insurance. Outside of this timeframe we are unable to claim from the couriers insurance. All products/parts that arrive which have been damaged in transit will be replaced 'like for like' free of charge in the quickest possible timeframe. For wooden items damaged in transit we will replace the damaged parts 'like for like' only and not the complete carton. This prevents the likelihood of the whole carton getting damaged as a whole carton for the second time. Replacement parts are packed individually and securely for transit. The return of parcels back to us (RTS – Returned To Sender) occurs when our courier has made 1 attempt at delivery, and the item(s) have been held in the local depot for 3 days (from the date of the first delivery attempt) and the recipient has not attempted to make alternative arrangements with Online4baby within this time frame. The driver will not be able to contact you directly before they make the delivery, however you will have received an automated text message on the morning of delivery with a 1 hour timeslot. Our Courier service Parcel Force will NOT leave with a neighbour even under instruction. This is not an option that is available under any circumstances. You can reply to the interactive text you receive from Parcel Force on the morning of delivery to reschedule the delivery if required. ** Please note if the delivery fails due to nobody being available to accept delivery then re delivery charge will apply. No our courier (Parcel Force) cannot deliver to PO Box addresses. Yes, all our customers receive a text message notification direct from Royal Mail, the first message is sent when the parcel is scanned at the Royal Mail Delivery Office to let you know the parcel will be delivered that day. Can I collect my parcel from a local store? Leave in a safe place - this is at the driver's discretion unless you have a private agreement with your postman/postwoman. You will be given the opportunity to rearrange delivery once with the depot, if that subsequent delivery is missed then the above reapplies. Before you refuse the delivery, we ask that you check inside the box to establish if the item itself has been damaged. (The packaging is simply used to protect the item whilst in transit) If you find the contents to be spoilt, please sign for the goods as damaged and contact us by email to customerservices@online4baby.com﻿ (please include your order number in the email) or contact us on 0161 688 1550. Our sales lines are open from 8:30 – 17:00 Monday to Friday (excluding bank holidays). Please call our dedicated sales team on 0161 688 1550 if you wish to place your order over the telephone. For security purposes we can only deliver the goods to the cardholders address. If you still experience difficulties, please contact us by email at sales@online4baby.com (please include your order number in the email) or contact us on 0161 688 1550. Did my payment go through correctly? If you were not directed to the order confirmation screen and did not receive an order confirmation email, it is unlikely that your payment was successful. Please contact us by email at sales@online4baby.com (please include the postcode you used when placing the order so that we can cross reference it with our payment server) or call us on 0161 688 1550. What cards do Online4Baby accept? **Please note**For security reasons we can only deliver the goods to the cardholders address. The security of your information is the highest priority for Online4Baby.com. We use WORLDPAY & PAYPAL as our Payment Service Provider. World Pay and PayPal are ultra secure Third parties which use 128-bit software (SSL) and encrypt all the Debit and Credit card information you input before it is sent to us. Online4baby.com does not hold, store or even see credit card details. I have already placed an order. Can I change the delivery address? If your order has not been picked, we can change the delivery address for you﻿. Time is of the essence! Due to our state of the art warehouse system, within seconds of your order confirmation, your order will be picked (some instances picking is later) and although we are extremely proud of our efficiency, this does mean that any orders that have been picked cannot be changed at this stage. We can change the delivery details with the courier the day after dispatch, but this may delay your delivery by 1 day. Please contact us by email at customerservices@online4baby.com (please include your order number in the email) or contact us on 0161 688 1550. I have already placed an order. Can I now change it? Time is of the essence! Due to our state of the art warehouse system, within seconds of your order confirmation, your order will be picked (some instances picking is later) and although we are extremely proud of our efficiency, this does mean that any orders that have been picked cannot be changed at this stage and you will have to follow Online4baby’s returns procedure. Please see F.A.Q "Can I return an item if I do not like it?" If your order has not yet been picked, you are able to change your order. Please Note**For an immediate response-during opening hours 8.30am to 5pm Monday to friday﻿, contact us on 0161 688 1550, alternatively for an immediate response﻿ outside of office opening hours we have 24/7 email support please contact us by email at customerservices@online4baby.com (Please make sure you include your order number on the email). If your order has not yet been picked, you are able to cancel your order and receive a full refund. For an immediate response contact us on 0161 688 1550. You can also contact us by email at customerservices@online4baby.com (Please make sure you include your order number on the email). I have cancelled my order. How long will my refund take? Once your order has been cancelled, your refund will be put back into the original payment method that was used. This is likely to be completed by the end of the next working day. Some banks may vary. Online4baby only accept payments made in pounds Sterling. I have received an email stating that my payment has been made by eCheque. What is an eCheque? Why has this happened? A PayPal payment method of eCheque occurs when PayPal have found an issue with your transaction or account. (There can be a number of reasons why PayPal do this, from being a newly set up account, to your card expiring or your account limit needs expanding etc.) An eCheque puts an Automatic 7-10 day holding period on your funds, giving PayPal opportunity to look into your transaction. We are happy to wait for the e-Cheque to clear and the goods are despatched upon cleared funds, or alternatively if you require instant despatch of your goods, you can call us on 0161 688 1550 to pay direct with credit/debit card and your e-cheque can be cancelled, and the funds returned back to your paypal account. Can I cancel my eCheque? You are able to cancel your eCheque by ringing the sales team on 0161 688 1550. Once cancelled, your payment will go back into your PayPal account, and then we can take payment over the phone with a Debit or Credit card for immediate despatch of your items. A pre-order item is a high demand product which Online 4 Baby have secured from the manufactures but not yet received. By purchasing a pre-order item this allows customers to secure and guarantee prompt delivery of their item as soon as the stock arrives from the manufacturers. When the order has been despatched you will be updated by email. When will I receive a pre-order item? If a product is a pre-order item, it will be clearly displayed on the product listing page along with the expected dispatch date. What do I do if the order I have received is incorrect? Due to a number of different reasons, it may be the case that the item inside the packaging differs from the description on the box i.e. for goods received from the manufacturer with multiple pieces in a single carton we do use recycled packaging. We ask that you check inside the box. If this has been done and you are still sure that you have been delivered an incorrect item, please contact us by email on customerservices@online4baby.com (please include your order number in the email) or contact us on 0161 688 1550. As long as the item you have received is still new, unused and you still have the original packaging; you will have 14 days (from the day after receipt of the item) in which you can contact Online4baby to book the item in for a return. Please contact us by email at returns@online4baby.com (please include your order number in the email) or contact us on 0161-688-1550. My item has become faulty in my warranty period. What are my options? All items supplied by Online4baby are covered by a 6 month guarantee, which starts from the date of receipt of your item. If your item shows any sign of a manufacturing fault within this period, we will send replacement parts or repair your item free of charge. In cases where this is not possible, we will offer a replacement. To report a fault with your item please contact us on 0161 688 1550 or email us at customerservices@online4baby.com (please include your order number in your email). For full details please see the Guarantee Section of our Terms & Conditions. The item I received is faulty. Can I return it? If you have just received an item and you believe this to be faulty please contact us on 0161 688 1550 or email us at customerservices@online4baby.com. If it is a faulty part that is replaceable, we will send spares for this, However. If a spare part is not possible we will replace the item. I have returned a faulty item for repair. How long will this take? We always aim to process returns in the quickest timeframe possible. However, in extreme circumstances, there can be a maximum waiting period of 28 days for faults to be repaired by the manufacturer. I have returned an item. When will I receive my refund? We aim to process returned items and refunds on the day the item(s) are received back with Online4baby. Once the item has been processed and authorised, your refund will be put back into the original payment method that was used. This is likely to be completed within 14 days. For full contact information please see Contact Us. What can I do if my enquiry is urgent? If you have an urgent enquiry, please call our sales team on 0161 688 1550 between 8:30 – 17:00 (excluding bank holidays). We aim to answer all emails in the quickest possible timeframe. Yes all our products are covered by a manufacturers 6 month guarantee. For full details please see the Product Guarantee Section of our Terms & Conditions. Will this buggy board fit my pram? Online4baby’s buggy boards are designed using a ‘universal fit’, meaning that the buggy board will fit 99% of all prams/pushchairs on the market. Unfortunately, we are unable to provide a conclusive list of buggies which they do/do not fit. However, if it so happens that the buggy board is not compatible with your buggy, you are able to return the item back to us (under distant selling regulations) for a full refund. Will this car seat fit my car? Online4baby’s car seats are designed using a ‘universal fit’, meaning that the car seat will fit 99% of all cars on the market. A correct fit is likely if the vehicle manufacturer has declared in the vehicle handbook that the vehicle is capable of accepting a "universal" car restraint for this age group. Unfortunately, we are unable to provide a conclusive list of cars which they do/do not fit in. However, if it so happens that the car seat is not compatible with your car, you are able to return the item back to us (under distant selling regulations) for a full refund. This parasol states it is universal. How do I know if it will fit my buggy? Online4baby’s parasols are designed using a ‘universal fit’ clamp, meaning that the parasol will fit 99% of all prams/pushchairs on the market. Unfortunately, we are unable to provide a conclusive list of buggies they do/do not fit on. However, if it so happens that the parasol is not compatible with your pushchair, you are able to return the item back to us (under distant selling regulations) for a full refund. An E-Gift is an Electronic Gift Card sent via email giving you the ideal opportunity to provide a family member or friend with the perfect gift. Please click here for full details e-Gift. Yes, Online4Baby.com has a price match guarantee. Find it cheaper & we'll match the price plus 10% of the difference! terms apply Do you like the reassurance and security of buying from one of the largest discounted nursery retailers in the country, but don't like the idea of paying over the odds? No problem! We are endlessly working to bring you the best possible prices. However, sometimes, somewhere, someone is selling the item you want for less. Let us help you get the best price! The Online4Baby Price Match means that whenever you shop with Online4Baby you can be confident that you are getting the best deal possible. It's simple. If you find the same product cheaper on any other UK website (including eBay and Amazon stores, but not individual eBay sellers or individual Amazon Marketplace sellers) we'll match the price and give you 10% of the difference. To request a price match, simply click the price match link against the product you wish to purchase (it's the Price Match Tag just below the price on the left hand side of the product details page) and fill in the form. We will review the details and reply to you via email within 24 hours. Alternatively, the quickest way would be to ring our sales enquiry line for an immediate response. 0161 688 1550. We do not price match any goods which have already been dispatched or paid for. Price match requests are strictly for new orders only. Simply complete the online credit application form, then carefully read the agreement and related information. If you are happy to proceed, you can sign the agreement online and click a button to send it to the finance company for an instant decision. If you are approved you will be asked you to pay the deposit online using a credit / debit card. Upon receipt of your deposit paid, Online4baby will be notified by the lender and we will be able to process your order. Please click here to view the Finance information page. Yes, a minimum deposit of 10% is required. You can choose to give up to 50% deposit. This must be payable by credit or debit card upon acceptance. You have the right under section 66A of the Consumer Credit Act 1974 to withdraw from the agreement without giving any reason before the end of 14 days (beginning with the day after the day on which the agreement is made or, if later, the date on which we will tell you that we have signed the agreement). If you wish to withdraw you must give the finance company notice in writing or by telephone or email. The name of your finance company will be clearly shown on your credit agreement. Please note that if you do give notice of withdrawal, you must repay the whole of the credit without delay and in any event by no later than 30 days after giving notice of withdrawal. You will also have to pay interest accrued from the date the agreement was made until the date you repay it. If you wish to pay by debit card please telephone the finance company. If you wish to pay by cheque please send it by first class post to the finance company. Please allow 10 working days from the day you post the cheque to allow time to process the payment.